Why Choose Us as your Rental Manager? We are the original rental agency for the town of Seaside, Florida, created by its founder. No other rental management company is more ingrained or committed to this area. We are locally owned and staffed. We sell more room nights in the area than anyone else. We have the largest existing database of guest history in Seaside, meaning more return guests, more revenue for our owners. For our Watercolor and Scenic 30A homes, our brand recognition, local reservations team and heavy website traffic drives results as our guest database grows. High guest satisfaction rates means return guests and more revenue for our owners. We invest more than $500,000 in sales and marketing efforts annually. No other competitor comes close. Our management structure is tailored to you and your needs, for your home, your area. We have the staff to make it happen. We can target your home to more than 100,000+ guests in our email database, reach 3.8 million page views annually on our website, consistently ranked #1 for search terms related to vacation rentals in Seaside, Florida and surrounding areas. We have the resources and manpower to keep your home in the best condition and provide the highest level of guest services including an on-site Welcome Center, complimentary bikes, and more. We are committed to the town of Seaside and the Seaside experience, protecting the community’s brand and legacy. We have also welcomed select homes in nearby 30A communities such as Watercolor, Seagrove Beach and surrounding 30A. We have the staff and infrastructure in place to service your home and guests. Contact one of our Rental Management specialists or complete the contact form below for a free revenue projection report and consultation. At Cottage Rental Agency, there is a dedicated Owner Services team that you can rely on and trust to care for your home. Our department is open seven days a week, from 8 a.m. to 5 p.m. and with our on-site location in Seaside, we open are available to ensure all needs are met and that your home is well-cared for. Our management staff has a combined 150+ years of experience in Seaside. Our total commitment and sincere dedication cannot be found at any other agency, no matter the claims made. Providing open lines of communication with homeowners and the various CRA departments. Administering the rental agreements and manage the requirements thereof. Producing Neighbors newsletter as a communication tool for detailing informative and pertinent information that is vital to homeowners and management relations. Having personal working knowledge of all cottages and needs of homeowners. Performing bi-monthly inspections to monitor ongoing quality. Performing annual quality assurance reports to assess the appropriate category for your home and assist with upgrades to generate higher rate of return on your investment. Promoting a successful destination rental program by cultivating new partners. We highly recommend the Cottage Rental Agency! We have had growth year after year with our rental cottage using CRA. We have had zero problems with housekeeping (sitting on the advisory board, I’ve seen first hand how they have approached fixing this area) and the two adventures that were a result of our 22+ year old cottage were handled seamlessly by CRA. WELL DONE! This is the 16th year that the core of knowledgeable, dedicated, and talented professionals at the Cottage Rental Agency have marketed and managed Love Me Tender, Love Me True to my complete satisfaction. And I am proud to say that I serve on CRA’s Rental Advisory Committee and encourage other owners to get involved. 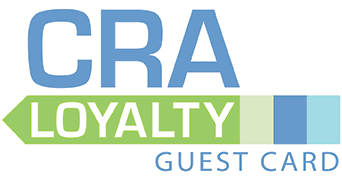 In my opinion, CRA is the brand standard that other agencies attempt to emulate…and the go-to source for those seeking Seaside’s finest cottage rentals. My wife and I completed construction of our home Banana Republic in 1994, and have had it on the CRA rental program every year. While the income is certainly nice to have, it has also been surprising and rewarding how little wear and tear the home has endured in those 19 seasons. I attribute this to the attention to detail exercised by CRA Owner Services. Every year, we get a complete and fair assessment of suggestions of what we need to do to keep our home current and worthy of the rental fees. When we need a recommendation for outside contractors, their referrals have always proven to be reliable firms. Because we live in New Jersey, it is comforting to know that we have them looking out for our best interests. Provides quality monthly routine maintenance for your cottage to assure everything is in working order at an affordable price. Handyman services including plumbing repairs, basic electrical wiring, caulking, grouting, painting and installation of appliances, fixtures and hot water heaters. Provides valuable services such as HVAC inspections/filter changes, hurricane preparations and winterizations to assist with protecting the value of your investment. Responds to and assists in-house guests with any needs or concerns they may have during their stay. Has a fleet of vehicles with proper equipment on-site for immediate response. Includes a team with more than 30 years of combined experience and knowledge of your home and of Seaside, FL. We live in Houston, TX, and are delighted to be new homeowners in Seaside. Our goal of renovating and refurnishing our cottage before the summer rental season could not have been achieved without the assistance of the CRA maintenance team. From prompt plumbing and air-conditioning repairs, to the installation of new appliances and Internet service, to receiving and storing of furnishings, and the recent installation of a barbecue grill, there seems to be no job beyond the expertise of the maintenance team. We feel very fortunate, and take comfort in knowing that if a problem arises, they will be on it and it will be a job well done. Everyone we came in contact with was extremely nice. Also, the technician who programmed the television sets was quite helpful and friendly. Our air went out the first night we arrived. I phoned it in and at 10:30 PM (15 minutes after we reported it), they came to fix it. They also came back the next morning to check on us. Amazing response time. We were so impressed that they came so fast and so late to see about our unit. Your service is prompt and very professional!! They came right away when I called about the icemaker and toilet handle!! We arrived early but called and let us in the room once it was ready! We hire 100% legal labor. Housekeeping Manager– plays an integral role overseeing the entire department and ensuring that all cottages are clean and well-maintained. Area Supervisors – CRA employs six supervisors that are assigned to specific cottages based on zone locations. They are responsible for inspecting your cottage after it has been cleaned by the teams, following any Homeowner particular books provided, as well as a very thorough checklist. Once your home is inspected, amenities are set and approval is given for guest arrival. P.M/Evening Housekeepers– Two year-round housekeepers are committed to providing services during late evening hours to ensure our guests’ housekeeping needs are met. Global Housekeeping Services– These reliable and top-performing third party companies are hired as additional labor to keep your homes clean during our peak season and as needed. CRA Cleaning Teams– Our core cleaning team works hard on a daily basis to ensure your homes are cleaned properly inside and out. Housekeeping Dispatchers– Dispatchers are the key to communicating and coordinating needs from internal team members and guests related to housekeeping services. SD Laundry/Delivery– Team members who pick up the linens after your cottage is cleaned, transport them to the laundry facility to be washed, and then sort the linens accordingly and deliver them back to the cleaning teams to be placed into your cottage for guest arrival. …I don’t think our stay could have been better! Everything was very clean and everyone was very helpful and nice. We were blown away by the focus to service and attention to details from the CRA. I expect that from a 5 star hotel, not so much from a rental agency. The best part of staying at this property was it is stocked with everything you need. Tons of bathroom towels- this is a big deal for a family of 6! Our daily housekeeping staff was excellent and was so courteous and quiet…. It was such a treat!! The housekeeping was excellent! They, of course, left us clean linens and towels, but they also folded the blankets we brought ourselves and made our room look great! 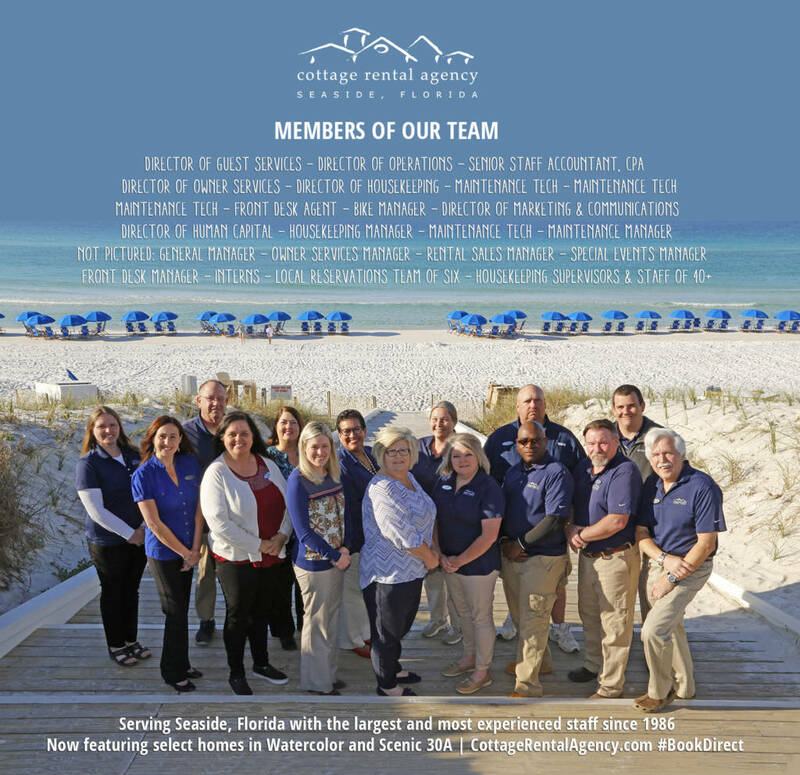 Cottage Rental Agency has made its professional housekeeping and maintenance services available to non-rental homeowners on Scenic Highway 30-A (from Rosemary Beach to Blue Mountain Beach). With reliable and affordable options, let us take care of your vacation home with the same commitment and expertise that have made us the premier vacation property rental management company since 1986. Our housekeeping program includes using our environmentally friendly equipment and specially formulated products, a dedicated cleaning team will dust, vacuum, wash and sanitize each room in the house from left to right, top to bottom, so no detail is overlooked. Click below for an example of our services offered in each program. Contact us for a free price list of services offered and customize your plan. For a custom free quote, call Lisa Dodd at (850) 699-4823 or send an e-mail. Our maintenance program offers non-rental homeowners peace of mind in insuring their vacation home is well-cared for. With an experienced team of professionals, services offered include basic routine maintenance to hurricane preparations and winterizations.